On the long and winding road through the Tinderbox area. The morning had hardly begun when, a little after 9am, I started walking southwards along the Tinderbox Road, knowing that most of the way would not be and could not be directly next to the Derwent River. In this area, with the exception of the occasional house surrounded closely by bush (I did imagine most of these households placed their trust against bushfires/wildfires in hope and household insurance), there is no way for easy access to the cliff edges, and there is no track along the top. I did not think it worth the risk to walk alone in an isolated bush area a long way from a road or houses. I have no doubt it is possible to walk more closely to the Derwent River, but doing so would not be a smart idea. No track, pavement or pathway exists beside the two lane Tinderbox Road. Throughout the day I walked on the road when no traffic was in sight or within hearing and I stepped along the verges (where there were any) when traffic was approaching. Thankfully, there were very few cars and sometimes 10 or 15 minutes would elapse without a vehicle on the road. The most disturbing vision for the day was a fresh road kill; the glistening innards of a young native animal, a Common Ring Tailed Possum, spread across the road and barely connected to the main body. These possums normally go out for their hunting during the evening and this fellow must have been racing home to bed when struck by a car racing down the road. 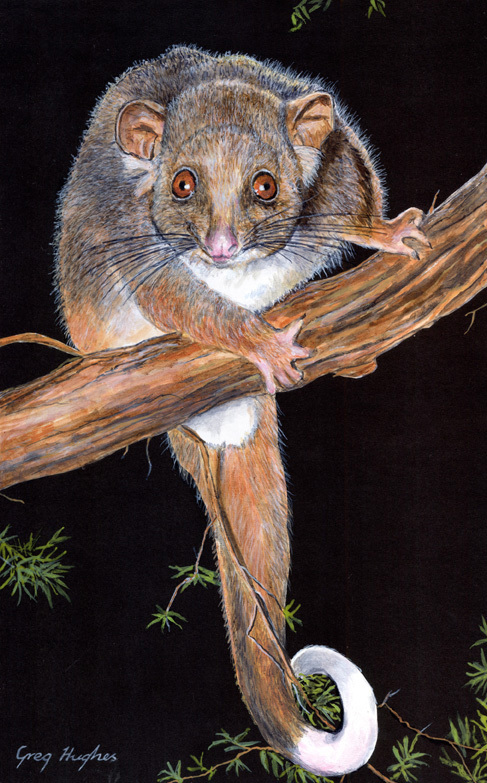 The image of a ring tailed possum below was created by Greg Hughes of arrowfire.deviantart.com at http://www.deviantart.com/art/Ringtail-Possum-344619937. On the upside, I was delighted to have a close encounter with a group of 6 large native Green Rosella birds. My good fortune to see these grand birds at close quarters occurred because the noise of two vehicles crossing paths from the two different directions made the birds comfortable and they did not hear my scrunching sounds as I walked on the roadside gravel. I stopped mid step as soon as I saw these heavy birds. During my walk from Geilston Bay to Risdon, I had the privilege of seeing a couple of these birds close by (read the posting From Risdon to Tommy’s Bight via Porters Bay and finally to the bus stop). Anywhere on the web, photographs of Green Rosellas can be found easily, however they all emphasise the lime green yellow throats as the main colour. In my experience, their deep green camouflaging backs defines their character. So … what were the birds doing as I watched them (one was employed only a metre away)? They were snacking on ripe blackberries and loving every moment of it. Inadvertently I moved a foot and the grating sound surprised them. The small pack of large Green Rosellas rose from the bushes and, in a flash of blue edged tails, were gone. What a thrill to see them: such private birds. Later a local dismissed my excitement. ‘They are everywhere here, and they try and get my blackberries before me as I work along the canes picking them’, she said. 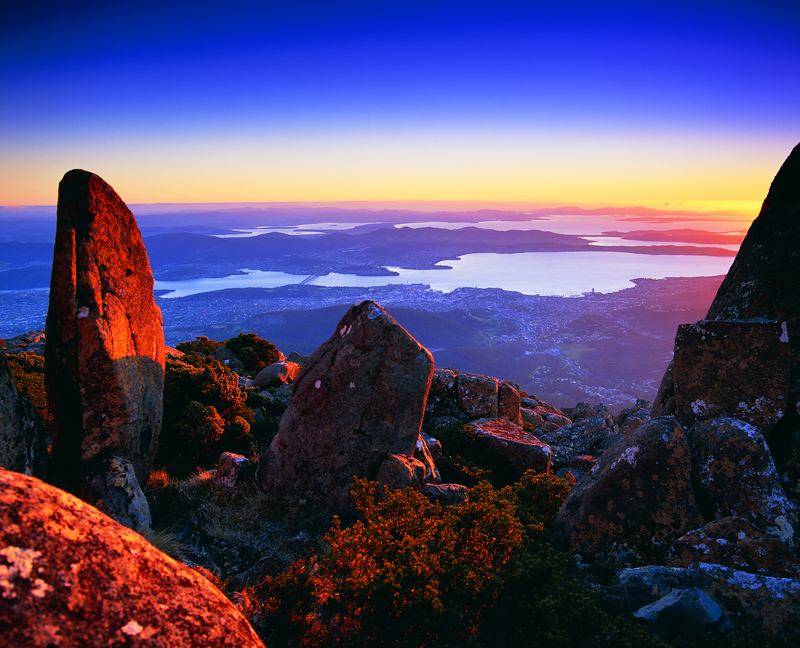 This entry was posted in Derwent River, Hobart, Tasmania, Walking and tagged blackberries, bushfire, Common Ring Tail Possum, Deviant Art, Geilston Bay, Green Rosella, Porter's Bay, Risdon, Tinderbox Road, Tommy's Bight, wildfire on February 28, 2015 by Tasmanian traveller. Poor possum! It reminds me of all the road kill we used to pass when on the road….. It used to get us down. So we started doing something really stupid! Whenever we saw a dead animal, we would pretend to “be” that animal… We would stiffen our body and try and imitate the stiffness, legs up in the air, or hands twisted round, or tongue hanging out! I know it sounds gross, but it made us laugh and released the tension of death along the road!